Today, the hallways of the Cony Flatiron Building are filled with a new senior class. 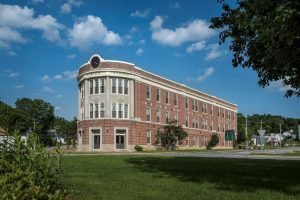 The historic rehabilitation of the Cony Flatiron Building in Augusta Maine, has transformed the historic Cony High School into affordable senior housing. The project has created forty-eight units of housing for the community’s growing senior population, including residents that were once Cony High School students. The building is located in the Capital City of Augusta, Maine overlooking Cony Traffic Circle, which is a very prominent location at the center of city activity. Constructed in 1926, the three-story building served as the city’s public high school until 2006. For members of the community and the students who occupied the halls for over 75 years, the building has considerable historic and sentimental importance. When Cony High School was moved to a new location, the Cony Flatiron Building was maintained as a heated storage facility, the City of Augusta spend $75,000 annually supporting building maintenance. For many years, The City searched for a creative developer willing to rehabilitate the building and bring new life to Cony Circle. In 2013 Cynthia Taylor of Housing Initiatives of New England Corporation (HINEC) proposed transforming the Cony Flatiron Building into senior affordable housing. The rehabilitation of the Cony Flatiron Building posed unusual challenges, including the city’s desire to preserve the auditorium, which was once the heart of school activities and public entertainment in the Capital City of Augusta, Maine. The auditorium became a focal point of the rehabilitation. 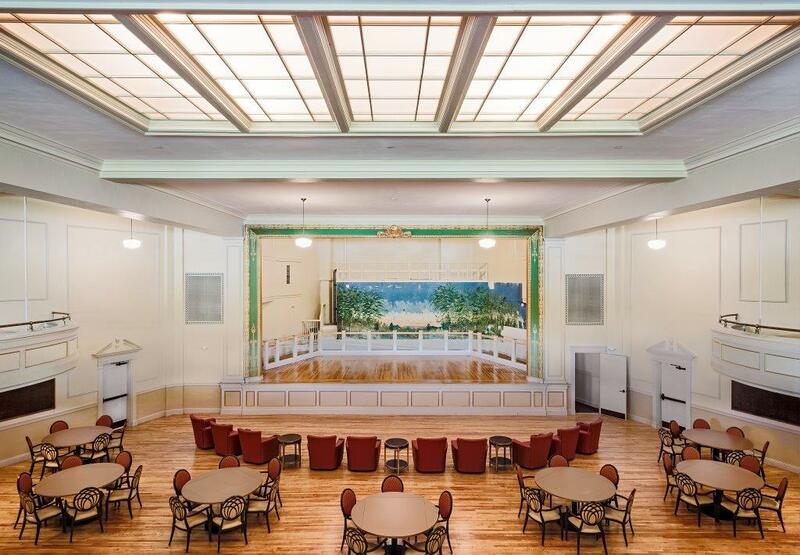 The challenge was to restore the auditorium to its original grandeur, without diminishing the number of units or square footage of the apartments. Through creative design solutions, it was decided to locate four apartments at the back of the auditorium, these units offer spectacular views over the Cony Circle through floor-to-ceiling windows. By placing four units towards the back of the auditorium, the complete balcony space was able to remain open. During the construction in the auditorium, the development team uncovered massive Palladian windows that had been bricked over in the 1980s. The Palladian windows have been restored and replicated from historic images and today they add generous natural light to the space. The auditorium includes original floors and restorations of old murals. Through historic paint analysis, all paint shades on walls and fixtures were matched to the original 1926 paint colors. Detail to historic significance was key to the transformation of the Cony Flatiron Building. The building was named after beneficiary Daniel Cony, who was a strong advocate for education in the Augusta Community. The clock at the flatiron “nose” of the building is dedicated in honor of Daniel Cony, and through the years has become a signature of the building. The historic clock has been restored, and remains a monument to the Cony Flatiron Building. The inscription on the clock reads, “Time Is Fleeting”. Other unique elements of restoration include, preservation of staircases and wide school hallways. Preservation of the original entrances into the classrooms as well as the historic main entry from Cony Circle. Each apartment features a small black plaque outside its door, made of materials re-purposed from the old school’s former chalkboards, with a label in the distinctive flatiron shape that gave the building its name, bearing each room number. The Cony Flatiron Senior Residents consists of forty eight affordable senior units, for tenants’ age 55+. Forty-one are one bedroom, of these twenty five are set aside for residents at 50% of AMI or below. The other sixteen are for tenants at 60% of AMI. Seven of the units are two bedrooms, four of these are for residents at 50% AMI and the other three at 60% of AMI. The units are on three floors, served by a single elevator. The units are considered large for a senior housing project, keeping with the historic theme, they follow the general configuration of a classroom. The one bedroom units range from 520 to 777 square feet, the two bedroom units range from 860 to 1040 square feet. The on-site building amenities are unmatched, there is a considerable amount of common area space, including laundry, office space, an exercise room and health office for visiting nurses. The redevelopment created a 1800 square foot archive room that displays historic interests concerning the building, which is a walk down memory lane for the residents of the Cony Flatiron Building and members of the community. Residents can also take part in community events hosted on site and the artfully restored Cony Flatiron auditorium. The project is an inspiring example of how community support, smart financing and creative design implementation could address a concern that has touched communities across the country- how to create appropriate affordable housing for the growing senior population.